Aikatsu Friends! – 040 | Mezashite! It’s funny how now they seem to have to bring in some kinda magic power to kinda move the shows forward it was like this with Aikatsu! Stars with the machine making Yume Performance so damm good and by the look at the end of this they are going to do the same with love me tears. This is why I always say Ichigo is the best as she never needed no magic powers or anything to make her way to the top of the Aikatsu! world. Well yea I kind of agree, but no one can tell how powerful the performance is if there was no (magic/miracle) at all. I mean, we’r done with big auras like it can’t get any further right?, for example lets compare Ichigo’s best performance when she had that huge aura surrounding her(Etude of radiance) and Elza’s sun-dress performance with little fragments of aura. see? I still get chills from that performance by how incredible was it. no hate for ichigo she’s my #1 but we gotta move on. “Zone” is a real thing in sport and Mio already did this. 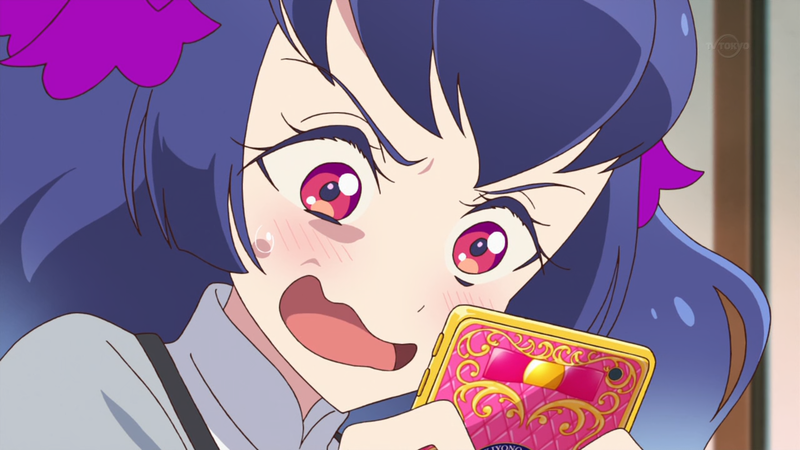 Ichigo make her way to the top of the Aikatsu! world because she was a prodigy with the quickest growth. Also dont forget that in stars already in the first season, Yume discovers the downside of her boosted performances. Reacting to that she starts training to overcome that power, in which she succeeds already before the final showdown of S1. So she made it into S4, and did all she archieved in S2 on her own power. Truth given at times with some help of her friends, but for sure without the boost of the aikatsu system. Also Ichigo’s growth is indeed remarkable, but the same could be said from Akari. In my opinion, everything in the mid-series episode range felt poorly executed and introduced *including* the whole Zone business, but I don’t think it’s actually a bad concept on its own. In fact, it fits the tone of the Friends series fairly well. As long as it doesn’t come out of anywhere last minute and is teased in advance, as happened in this episode, it gives the opportunity to take the plot in interesting new directions all the while creating more suspense and tension for the viewer. With that said, let’s talk about how you’re worried it’s a magic used in order to win. It would be ridiculous to insist Ichigo or Akari never went into a similar ‘zone’ or weren’t pushed over the edge into going all-out when the situation called for it. The only difference here is that the concept now has a name applied to it and is more clearly evident to the viewer in order to add an extra level of uncertainty to the matchups, much like the Appeals. It’s more of a mind games thing than a way to cheapen the plot. In case that they two do decide to utilise the Love Me Zone in their performance, I can guarantee you Pure Palette will also go into their Zone and in turn slightly beat Love Me Tear with it to win the Cup. I understand you being worried about how it might feel contrived, since I feel a lot of Friends is contrived, but this doesn’t seem like anything to worry about. Haven’t ever seen a Dragon Ball show in full, so that might be slightly off. Those poor Moon Twins never stood a chance. They didn’t even get a training montage, just some slight jogging to the arena. I was expecting Pure Palette to win the final thanks to the power of friendship, but with so many episodes left, maybe they will go for a different outcome instead. I’m not sure how we were expected to believe (and some of the people in the show believed) they might actually top Love Me Tear. As far as I’m concerned, they’ve done nothing significant or noteworthy (relative to LMT) in the entire time they’ve been around. They’re also given next to no screen time compared to Pure Palette and Honey Cat, so it seemed obvious that they would never win. I was annoyed by most of the early episodes involving the sisters and found them obnoxious—the harder the show kept trying to sell me on the two of them and their unit, the more I disliked them—but now that the focus is off them and with episodes like this one and the treasure hunt episode they’re starting to feel “OK” to me, which was unfortunately supposed to happen 20 episodes ago. Hmmm. Honestly, I’m not sure what I’m expecting at the end of this battle. I guess it depends on whether they’re feeling bold enough to break away from the usual formula. From some of the earlier comments, it sounds like some are getting the Aikatsu Zone confused with the Love Me (Tear) Zone. I doubt there is much between those two that you can actually get confused about. As described earlier in the series there is an certain state on stage idols can get into which is called the Aikatsu Zone. If those idols happen to be Love Me Tear, you get the Love Me Tear Zone. They both refer to the same state of performance. The difference is that the Aikatsu Zone is more general (any idol can get to it) while the Love Me Tear Zone is the Aikatsu Zone just for Love Me Tear. I wouldn’t be surprised if we happen to see a Pure Pallete Zone also in the near future. I have high hopes for the next few episodes and the fallout from said arc, given that the story will be returning to the ‘Zone’ plot point that was prevalent in the Brillant Friends Cup arc, as well as shedding more light on LMT’s connection to the current situation at hand and tying all elements into the season finale, thus coming full circle altogether. When you think about it, I like how Friends is tying up a plot point from an previous arc (the ‘Zone’ phenomenon) and inserting it into a future arc in a way that will shed light on LMT and give their characters, especially Karen a few extra layers of dimension, as well as moving the story ahead in an completely natural way. Feel free to correct me if I’m wrong, but I consider this to be an overall improvement on how Stars S1 botched its ‘rainbow power’ arc and then ignored it without ever bothering to go in depth or integrate some of its plot points into the final arc of the season aka the S4 Selection.